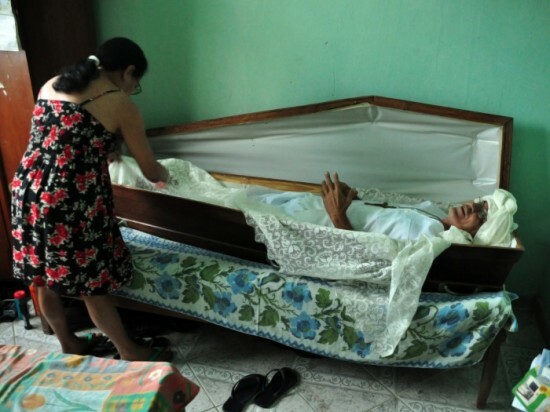 Zelli Rossi, from Sao Paolo, Brazil, has been sleeping in a coffin for the last 23 years, as a way of honoring the memory of a friend who died in 1988. The story of Zelli Rosi and his bizarre sleeping habit would have probably remained a family secret if his 14-year-old grandson hadn’t decided to write a story about it in the school newspaper. Apparently, he and a childhood friend once promised each other to buy the coffin of whoever of them died first. In 1983 he was involved in a serious car crash, and his good friend, who had heard rumors he had died, honored their agreement and bought a casket for Zelli. But he wasn’t really dead. A speeding car had crashed into him while he was sitting on his bike and he was hospitalized for four months. He tried to return the casket but his friend wouldn’t take it back, so he kept it in his home. in 1988, Zelli’s friend died as a result of multiple stab wounds, after being mistaken for someone else, and he not only kept his part of the bargain by buying a brand new casket for him, but he also started to have his Friday night sleep in the casket he kept, to honor his memory. This has been going on for the last 23 years, and apparently Zelli Rossi’s family doesn’t have a problem with this unusual arrangement. His wife even helps prepare the coffin and helps him get comfortable in it. She always thought it was a bit weird, but says she was never scared. Zelli’s grandson says he’s now a neighborhood legend, but admits most of his friends don’t visit him as his grandparents’ house.